Depressive symptoms vary in severity and chronicity. 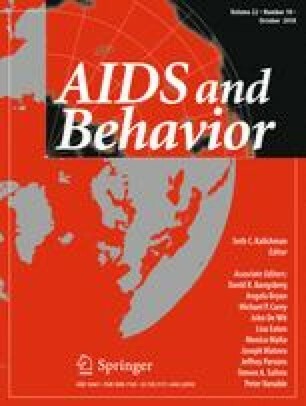 We used group-based trajectory models to describe trajectories of depressive symptoms (measured using the Patient Health Questionnaire-9) and predictors of trajectory group membership among 1493 HIV-infected men (84%) and 292 HIV-infected women (16%). At baseline, 29% of women and 26% of men had depressive symptoms. Over a median of 30 months of follow-up, we identified four depressive symptom trajectories for women (labeled “low” [experienced by 56% of women], “mild/moderate” [24%], “improving” [14%], and “severe” [6%]) and five for men (“low” [61%], “mild/moderate” [14%], “rebounding” [5%], “improving” [13%], and “severe” [7%]). Baseline antidepressant prescription, panic symptoms, and prior mental health diagnoses were associated with more severe or dynamic depressive symptom trajectories. Nearly a quarter of participants experienced some depressive symptoms, highlighting the need for improved depression management. Addressing more severe or dynamic depressive symptom trajectories may require interventions that additionally address mental health comorbidities. Presentation A version of this work was presented at the 50th Society for Epidemiological Research (SER) Meeting June 21–23, 2017 in Seattle, Washington. The online version of this article ( https://doi.org/10.1007/s10461-018-2109-2) contains supplementary material, which is available to authorized users. The authors wish to thank the University of North Carolina at Chapel Hill Center for AIDS Research and National Institutes of Health [Grant Numbers R01MH100970, R24AI067039, P30 AI50410, L30MH110572, K99MH112413, and UL1TR001111], which supported this work. Dr. Bengtson was supported by a career development award from the National Institute of Mental Health [Grant Number K99MH112413]. All procedures performed in studies involving human participants were in accordance with the ethical standards of the institutional review board at each CNICS site and with the 1964 Helsinki declaration and its later amendments or comparable ethical standards. Informed consent to participate in the CNICS cohort was obtained from all individual participants included in the study. Informed consent to participate in the CNICS cohort was obtained from all individual participants included in the study.